UNITED NATIONS, November 10, updated -- As UN Secretary General Ban Ki-moon's administration faces a shakeup, there's much speculation about who will replaced Department of Political Affairs chief Lynn Pascoe in February or April -- another American, it's said -- and who may or may not replace World Food Program director Josette Sheeran. But down a rung or two the changes have already begun, in the name of mobility or at least changing UN jobs every five years. 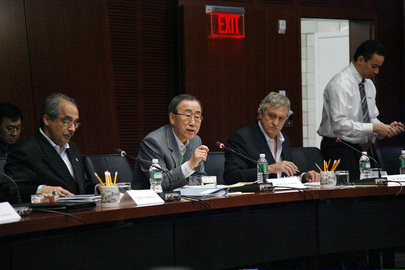 After Michael Williams announced he would leave his Lebanon envoy post under Security Council Resolution 1701, a competition began between current Afghanistan envoy De Mistura (who would prefer to go to Rome), former Spanish foreign minister Moratinos (viewed by some as too close with Syria) and the candidate declared the winner by well informed UN correspondent Ali Barada of An-Nahar: Nicholas Haysom. Haysom has been a high point in Ban's first term inner circle, but applied not long ago to "ship out" to the new UN Mission in South Sudan, reportedly in the name of Ban's only partially implemented policy of mobility. Senior advisers Vijay Nambiar and Kim Won-soo, for example, appear exempt from the policy. For Haysom, Beirut seems to be a better fit, and Barada reports it will happen mid-December, pending some last minute questions in the North Lawn building's third floor. To replace Pascoe, Inner City Press is told that the US has already provide names. To replace Sheeran, while the Obama administration has put forward another name alongside Cousin, Sheeran is said to be fighting back using Republicans in the US Congress, threatening to cut funding to WFP if Sheeran is replaced. Ban with Nambiar - what 5 year limit? - & Hayson: Beirut bound? Inner City Press put this question not only to Sheeran's spokespeople including Greg Barrow, but to Sheeran herself when she attended Ban's Chief Executive Board meeting, without any substantive answer. Not mentioned yet in coverage of whose who've been in place five years or more is "global goods" adviser Robert Orr, who is also among the officials who didn't respond to Ban's call for public financial disclosure. (But see UN's Nov 17 response to Nov 8 question, published Nov 20, here.) More on this one soon. Watch this site.